I took the watch at 11:30 P.M. and continued steering the ship to the points Bert had plotted. Bert was back on at 2:30 A.M. to relieve me. I was dead tired and crashed at 3:00 A.M. I awoke at 8:30 A.M. to a beautiful morning. The boat did well during the night and the seas had calmed down a bit. We are almost to the Belize border. 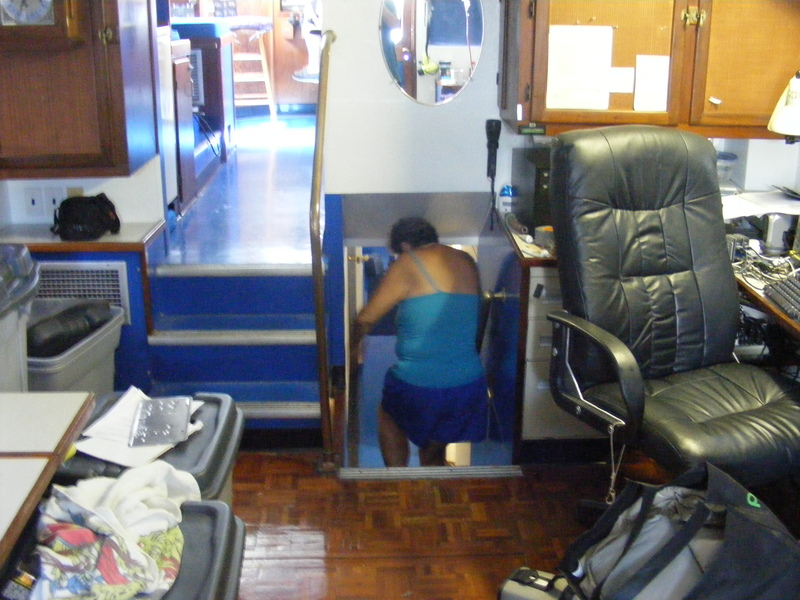 I took photos, added more oil to the engine, and shot various video segments inside the boat and engine room. I installed Coastal Explorer on my Eee PC and am learning to use it. At the start of the trip I set up my Eee on the bridge to the left of the nav computer. Bert loaned me a USB GPS module and I was running charts alongside the nav computer. I was running Sea Clear which I like very much. This enabled me to explore the charts without disturbing the dedicated navigation computer and the Eee could serve as a backup if the nav computer failed. The Eee worked great in this capacity. By the end of the trip I had installed and running Sea Clear, Coastal Explorer, and Capn Voyager. All ran fine. By late morning we had passed the southern limit of Mexico and were heading south off the coast of Belize, passing Ambergris Caye on our way to Grennell’s Channel. Our plan is to raise the Q flag and anchor in Grennell’s Channel some time tonight. This day was fairly uneventful, just steady progress south. Bert made a huge dinner but I suspect he has a second dinner planned for later tonight. 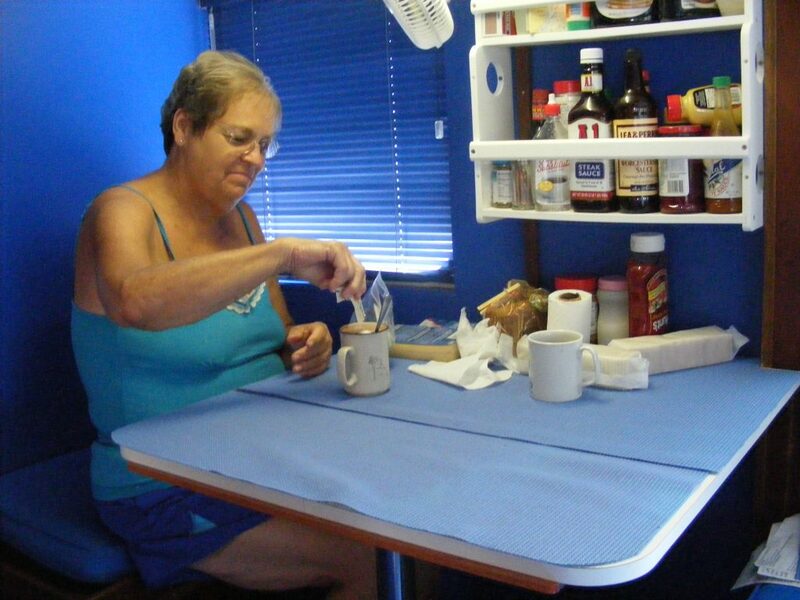 Nancy at the dinette. Click to view larger. Nancy heading below to her stateroom. Click to view larger. We entered the eastern end of Grennell’s Channel in the dark and the process of piloting through there at night was very instructive, threading our way, turn by turn, from one marker light to the next. I dunno. I’m not sure I’d want to try it without GPS and charting software. This process was more complex than entering Isla Mujeres but it was less stressful. In Grennell’s Channel, the lights pretty much matched what we expected to find. At Isla, this was not the case. There, we could hardly find the lights and when we did they did not agree with the chart. Finally, around 9:00 P.M., we reached the western end of Grennell’s Channel where Bert took a left turn and after a bit of exploring with the depth sounder, we dropped anchor on an underwater plateau, in a spot with just 2 feet of water under the keel. 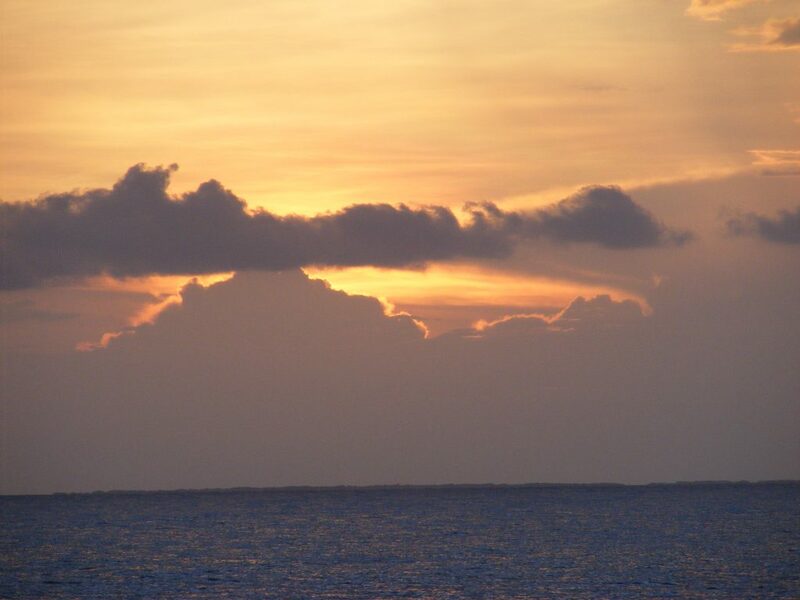 Sunset at sea. Click to view larger. Sea life attracted by a bright light. Click to view larger. Once we were secured, Bert produced a special 100 watt halogen lamp in a waterproof glass tube. This he lowered into the water and turned on. Bert was expecting fairly clear water but the water was murky. 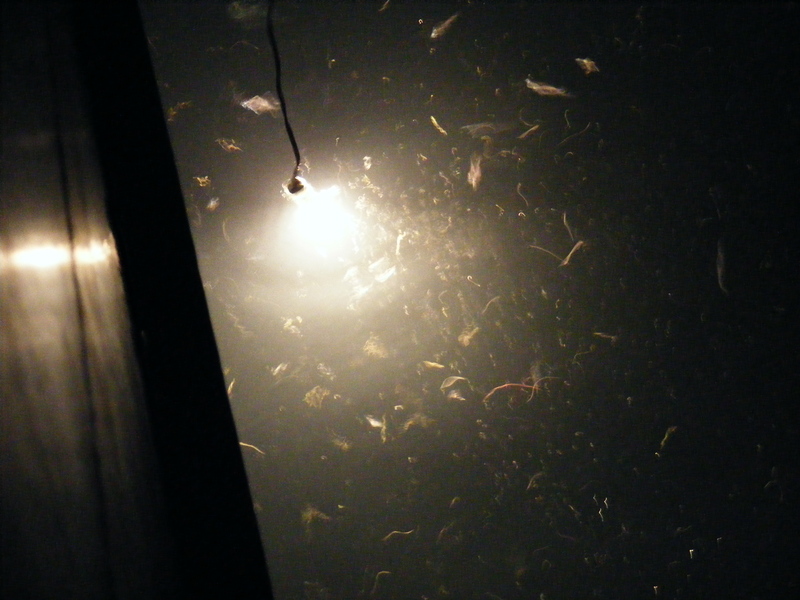 Soon the light began to attract sea creatures of all kinds including thousands of krill. I took photos and videos but the conditions were not very good for photography. Everything was in motion — just a roiling turmoil of sea creatures. Bert made some big hamburgers for dinner — bleu cheese burgers. Nancy had gone to bed early and skipped dinner. After dinner, Bert and I had some rum and gin to celebrate another landfall, and then sat around talking until we got tired and went to bed. Bert at the helm. 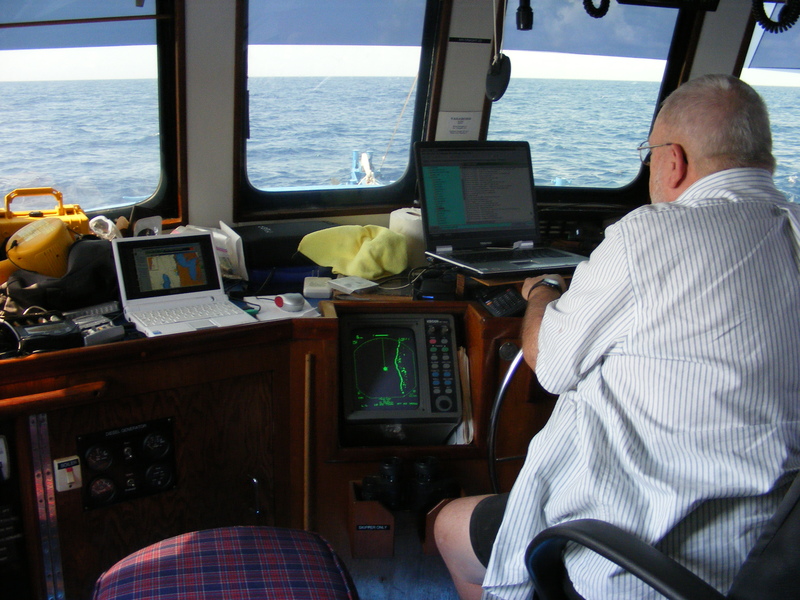 Nav software on both computers and radar display below them. Click to view larger.